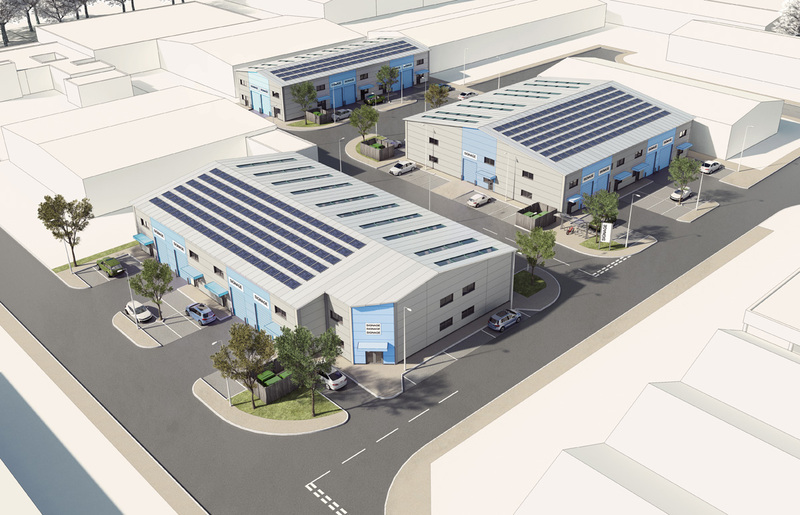 We were appointed by Portsmouth City Council to design new industrial units on the former A.E. Hadley site in Hilsea, as an extension to the existing Limberline Industrial Estate. The estate is important to the continued development of the Hilsea area, and new industrial units will create a number of direct and indirect jobs. Flexibility was key to the design, allowing businesses to develop and expand without having to relocate. The scheme has a variety of unit types and sizes to suit a wide range of businesses. A total of 22 units are provided, ranging from 50m² to 200m², with allocated parking for each unit. Internally, the 6m eaves height allows for mezzanines should tenants require it. Most units are for B2 General Industrial use but some small units are designed for A3 and A5 food and drink uses. The buildings have been designed to sit comfortably within their context, with a scale and height similar to that of the surrounding environment. The appearance is simple and crisp, with a composite cladding system providing a durable finish to the buildings. By using a restrained palette of materials and contrasting colours for entrances and delivery areas, the scheme is legible for tenants and visitors, and unified architecturally. Internal cycle storage for employers and a covered cycle shelter for visitors helps promote sustainable and healthy travel. Planning consent was obtained in mid-October and works are due to start on site in the New Year.